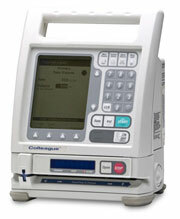 Save up to 80% on pre-owned Baxter Colleague CS infusion pumps. Note: Rate limits can be configured for values less Than those stated above. 0.1 - 5 mL/hr in 0.1 mL increments (configurable option) or programmed rate whichever is less. At the same rate programmed for the current primary or piggyback infusion. The Air Bubble Setting is a configurable option. Allows the pump channel to automatically restart if an occlusion is relieved within one minute after detection. This configuration option allows 0 to 9 restarts before manual intervention is required. Pump will operate at all programmable flow rates with a solution container height ranging from -36 to +48 inches. Container height is measured from the pump channel selected for use. Attachment to a remote nurse call system A variety of systems exist which enable alert and alarm conditions to be transmitted to a remote location via the communications port on the rear panel assembly of the pump. See the service manual for additional information.